How does a lady of a certain age with an Australian twang end up running her own wine business - the Grassington Wine Shop - in the heart of the Yorkshire Dales? Jackie Sugden’s journey to the centre of Grassington comes with a certain amount of baggage, a huge amount of expertise and a sense of humour very much intact. From Yorkshire parentage but born in Norwich in 1957, Jackie describes her childhood as nomadic as her father climbed the corporate ladder of the electrical engineering world. Her first accent was Geordie, picked up during a spell in Newcastle-Upon-Tyne but quickly shed as the family moved to its complete antithesis; the idyllic hamlet of Waldringfield in Suffolk where Jackie first fell in love with sailing on the River Deben. From there the family landed in Sevenoaks for her grammar school and college years, and she remained when her parents headed back north to Ilkley in 1975. Twenty years in the international corporate world followed as Jackie worked for Mobil Oil in Sevenoaks, then TSB Trustcard, Westpac Banking in Sydney and Bendigo Bank, north of Melbourne. Her love of Australia was born from a year spent sailing in 1987-8 on a tall-ship with the First Fleet Re-Enactment voyage and in 1989 she decided to emigrate. Most of us just enjoy drinking wine, but after five years in the Sydney banking world Jackie yearned for a complete change of pace and lifestyle. She decided to take a sabbatical to work and study in the Australian wine industry after having had an insight into the work while grape-picking as a student in France. And so her passion for discovering and sharing wine’s innermost secrets blossomed. Not content with just learning about it, Jackie wanted to get her hands dirty. While at Charles Sturt University, Wagga Wagga studying a BSc in Wine Science she met her husband. After spending a two year apprenticeship as a winemaker at Bowen Estate, Coonawarra, together they realised a dream; to take on their own vineyard in 1998. A 300 acre smallholding in the Bendigo region of Victoria, Nuggetty Vineyard is two hours north of Melbourne. Alongside their 25 acre vineyard, Jackie and Greg ran “a mob” of 100 sheep, kept chickens, grew their own vegetables and fruit trees – apples, pears, plums, oranges, lemons and limes - and prepared the land for an olive grove. Their home and livelihood were built on environmentally conscious principles, with solar passive construction and no mains water. Rain tanks collected water and the pair adopted a grey-water re-cycling system watering the gardens, while dams fed the vineyards with drip irrigation. Mains electricity was supplemented with solar electricity. With reduced use of herbicides, pesticides and chemicals they worked towards organic status. A small producer, Nuggetty Vineyard produced only 1000 cases per year of premium wines from Semillon, Cabernet Sauvignon and Shiraz grapes. The emphasis in production was on hand-made wines with hand-tended vines, hand harvested grapes and small open fermenters plunged by hand. Compressed air pressure allowed for a gentle press with no crushing of pips or tearing of skins and the finest oak barriques used for barrel fermentation and maturation. At weekends the vineyard opened for wine tastings and functions and Jackie hosted wine appreciation classes. Despite the sheer hard graft, determination and love poured into Nuggetty Vineyard, nature can be very cruel. A severe eight year long drought resulted in dust, deficiency, depression and ultimately divorce. Jackie made the heart-breaking decision to return to the UK in 2007 and the property was sold in 2009. So, how to pick up the pieces? With parents in Ilkley, Jackie headed naturally to Yorkshire and joined a local independent merchant, Martinez Wines. There she flung herself into the business of wine buying, corporate events, tastings, appreciation courses, web sales, staff training and just about everything else. Five years on and a perfect opportunity arose. 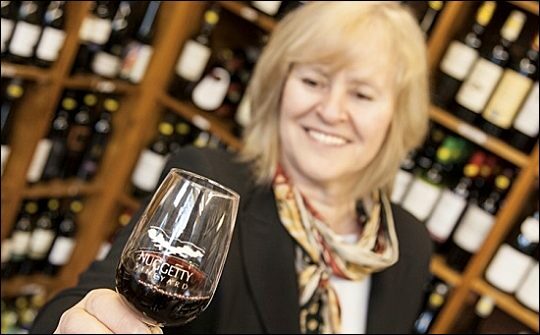 When Jackie learned that an independent wine shop overlooking the picturesque cobbled square of Grassington was on the market she felt destiny calling again. In October 2012, keys in hand, baggage neatly bundled, bursting with a new lease of energy and enthusiasm, Jackie Sugden landed in Grassington, where she had spent many happy childhood days exploring the Yorkshire Dales. 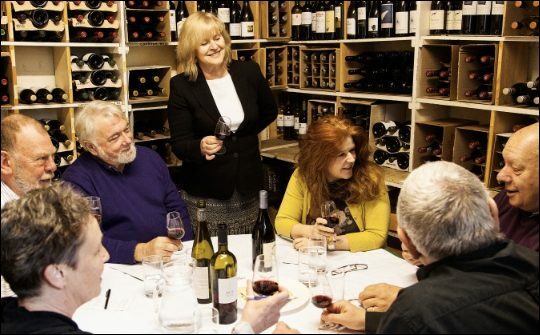 It can be confusing for visitors to a small wine shop in the Yorkshire Dales to be met by a smiling, apparently Australian lady where perhaps they might be expecting a more traditional northern accent, but Jackie’s irresistible cheeky charm soon reassures them that she is of Yorkshire stock really. With her extensive knowledge of wine, customers are treated to the full provenance of every bottle sold in her shop; whether it’s a budget rosé for the BBQ or a really good red for a special occasion. It’s wine expertise without the snobbery that the Yorkshire folk just love.